Four stick n’ poke artists tattooed during Nov. 18-19 at Tiny Flame’s second pop-up market. Photos Shannon Carranco. Up four flights of stairs in a dingy business complex off of St. Laurent Blvd., you’ll find a warmly-lit, plant-filled loft with the smell of homemade food wafting through the air. Last weekend, the DIY space on Pine Ave.—which usually doubles as a sprout farm—became the temporary home of Tiny Flame’s second pop-up market. The event was complete with vintage clothing, handmade gifts, art and most notably, on-the-spot hand-poked tattoos. The small but intimate market space hosted ten vendors in a large communal space, as well as four stick n’ poke artists set up in a makeshift tattoo parlour over the course of two days. Its two organizers, Sophie Marisol and C.T. Thorne—both artists in their own rights—were excited to put on a community market after working together over the summer. Over the last few years, alternative/DIY craft markets have popped up all over the city. 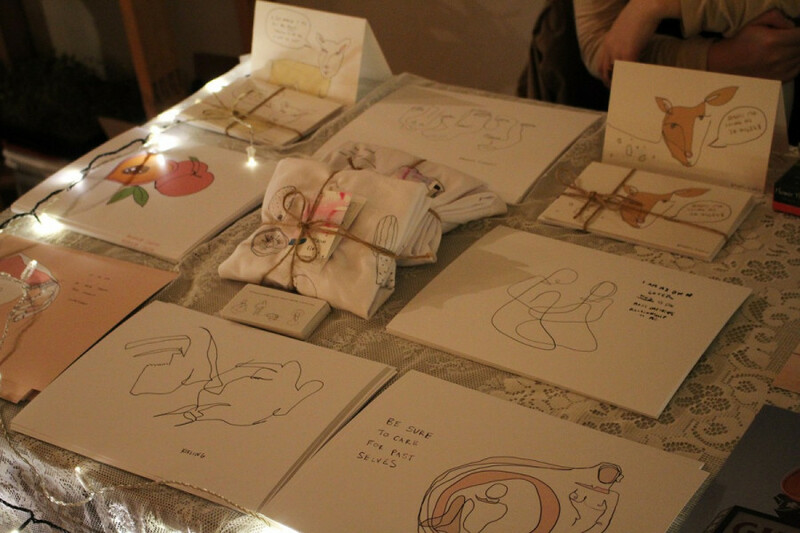 There were three seasonal artist-run “soft markets” which took place very successfully over the course of last year, as well as other events like Queer Between the Covers, a zine and art fair which happens every summer. 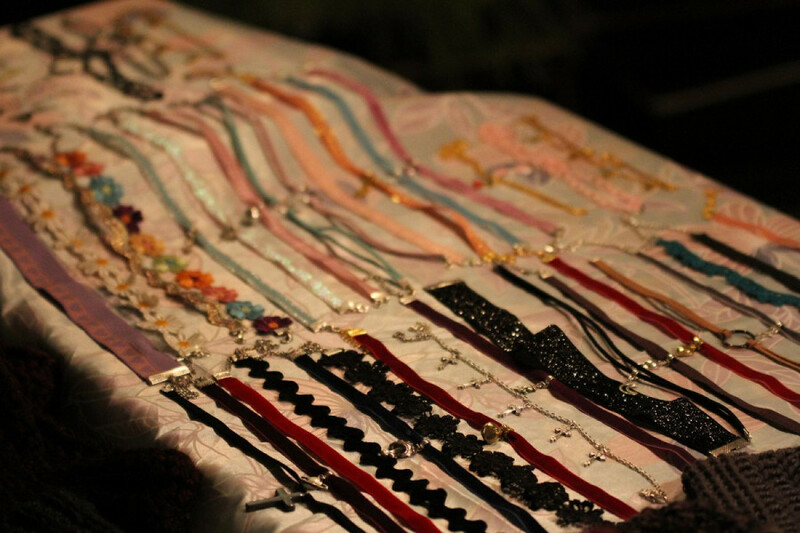 Rufina Ip’s chokers displayed lovingly across a table. Tiny Flame’s pop-up series responds to a city-wide need for new kinds of retail environments which are not solely focused on sales. With many queer, trans and non-binary vendors, the market presented a safe space in which folks could enjoy the atmosphere and browse without the pressure of having to spend money. “We’ve been refining it as we go and responding to needs from vendors. That’s kind of what makes it viable, I think, is that it’s DIY and we figure it out as we go,” said Thorne. The go-with-the-flow attitude gave the market a laid-back vibe. “Whatever happens, whatever salespeople make, we want—especially our artists and vendors—to come away thinking ‘I had a great weekend,’” added Marisol, whose prints were also on sale during the market. Thorne’s gender-neutral vintage fashion collection was on display along with many other items, including adjustable leather pieces and modified pieces from three other vendors. The owner of the space, which doubles as a sprouting farm, kindly cooked up homemade food and drinks. 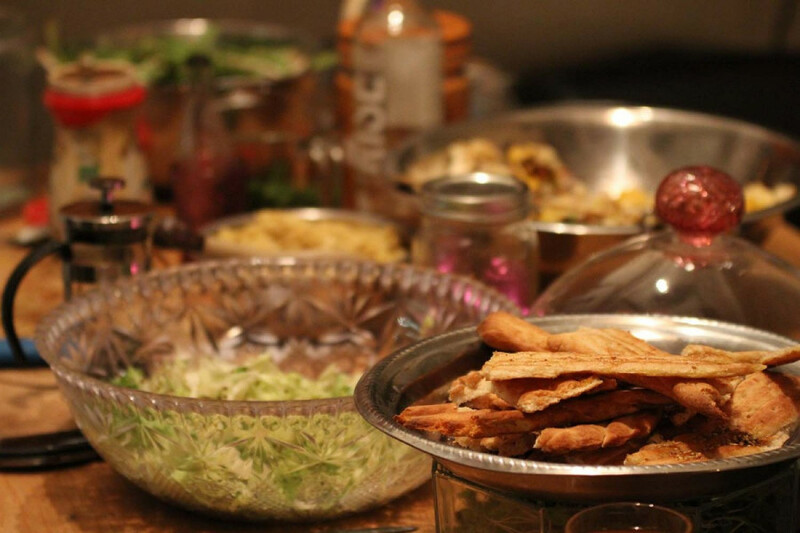 Having an inclusive variety of vendors is a central theme in Tiny Flame’s pop-ups. Products, especially clothing, were not merchandised by gender. While people were in the larger room connecting with one another, eating delicious food and shopping, some folks received stick n’ poke tattoos from artists’ flash books. Many might wonder whether hand-poked tattoos are safe and sanitary, but Marisol and Thorne were confident that the setup was professional. “We always let the negotiation between body and tattoo and money occur just between the client and the tattooist… so that’s the emotional safety component,” offered Thorne, adding that the separated room has gurneys for all of the sterilized equipment and is well-lit. Other vendors included photographers, illustrators, and people who made skin and beauty products. 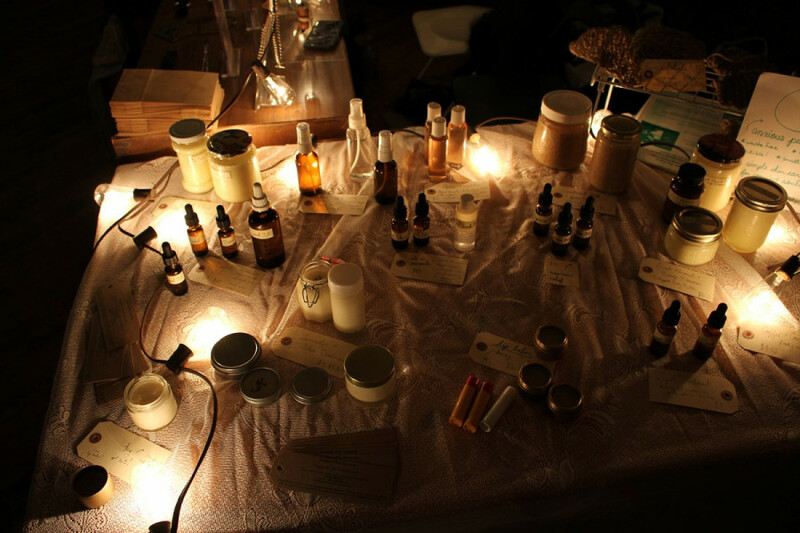 Anxious Pea’s table featured homemade beauty products, from whipped coconut body butters to beard oils. Hannah Ciordas and Emma Mutch—both Concordia students in the women’s studies program— were tabling together to sell their artworks. They paid $40 to table for the weekend, a fair price compared to what many artists are used to in Montreal. Ciordas said that while looking into other markets, she came across tabling fees as high as $300 for a weekend. “The stuff I am selling is, like, twenty bucks, there’s no way I’m gonna make it back, so this is pretty sweet,” she explained. The affordable fee makes the event accessible to vendors, and for attendees, there was no door fee. Ciordas’s illustrations featured work from her thesis, an auto-ethnographic project which focuses on providing solidarity towards other people that have experienced sexual violence or dealt with difficulties in terms of gender and identity. “A lot of it is about the way that we can find safety in our own bodies and can be our own lover and our own best friends,” said Ciordas. Mutch’s work, on the other hand, featured her own photography and her new zine project, “Into Thin Hair,” for which the first two issues were on sale. “It’s talking about hair and skin as a very femme beauty narrative, but at the same time, it’s not just about that,” she explained, motioning to her two photo zines. Between clothing, artwork, beauty products and the smell of minty mojitos and homemade cooking, the second instalment of Tiny Flame’s DIY markets presented a successful structure for alternative spaces to shop.